The idea of a house call doctor might seem old-fashioned to some, but the fact is, for many patients, there is no better health care option than the convenience and individualized care that comes from treatment in the comfort of one's own home. That's why, for medical urgent care, West Los Angeles residents regularly turn to Dr. Michael Farzam of House Call Doctor Los Angeles. As a board-certified physician with the American Board of Internal Medicine, Dr. Farzam is an on call doctor who is committed to providing every patient with a high level of care and personal attention. While he is regularly called upon to provide urgent care to West Los Angeles residents suffering from minor injuries, the scope of his skillset is truly staggering. In fact, Dr. Farzam specializes in treating acute illness, headaches, influenza, seasonal allergies, ear nose and throat ailments, urinary tract infections, lacerations, cold sores, and much more. For years, Dr. Farzam has been providing convenient urgent care in West Los Angeles and surrounding regions, and he understands firsthand how important it is for patients to receive care that is specialized to their specific needs. That's why concierge medicine is a growing trend in today's health care environment – in today's fast-paced culture, personalized care and empathy is more important than ever. 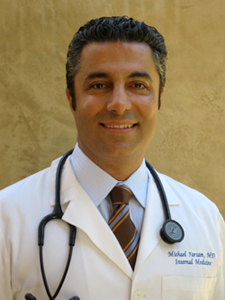 Even so, Dr. Farzam remains the concierge doctor Los Angeles residents can trust first and foremost. Whether you're in need of urgent care in North Hollywood, Brentwood, Inglewood, or any other region of L.A., you can take advantage of Dr. Farzam's one-of-a-kind, 24/7 service via cell phone and email. The team at House Call Doctor Los Angeles wants you to know that they take your medical treatment seriously. They're eager to offer urgent care from Rancho Palos Verdes to Westwood and the greater L.A. area.